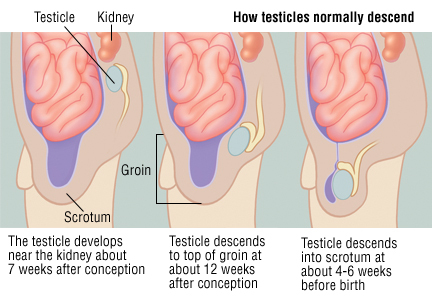 An undescended testicle, also called cryptorchidism, is a testicle that has not moved down into the scrotum. Early in pregnancy, the testicles begin developing deep within the abdomen, influenced by several hormones. At 32 to 36 weeks' gestation, the testicles begin to descend into the scrotum. In 30% of premature and approximately 3% of full-term male infants, one or both of the testicles have not completed their descent at the time of birth. Most of these will then descend spontaneously during the first three to six months of life. By 6 months of age, less than 1% of babies still have the problem. Either one or both testicles can be affected. An undescended testicle increases the risk of infertility (not being able to have children), testicular cancer, hernias and testicular torsion (twisting). An empty scrotum also can cause significant psychological stress as the boy gets older. For these reasons, early treatment is very important.